The old saying ‘buy cheap, buy problems’ rings true in many food production operations. It is certainly true in rotary moulding of soft dough biscuits. Any moulder may run well on basic products at low production speeds – but in more demanding applications, low-spec machines run into trouble. The more you can adjust on a rotary moulder, the more control over the process you have. The most basic machines have a fixed roll gap and scraper and just one drive – very easy to set up, but not many options if it does not perform as expected. Adding one or more of adjustable scraper, adjustable forcing roll gap and variable-speed independent roll and web drives gives increasing levels of control over problems such as under-filled cavities, poor extraction, variable weights and short web life. These problems tend to worsen as line speed and product size (particularly depth) increase or as the dough becomes less workable. 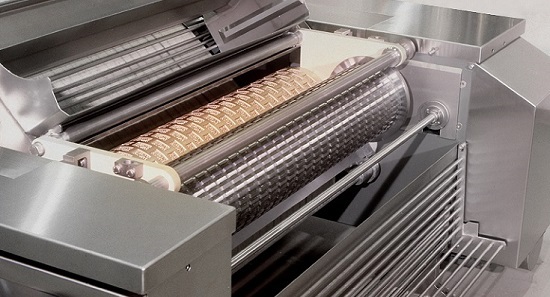 Every rotary moulder has an adjustable rubber-covered roll. This is raised into position by the operator bringing the belt into contact with the moulding roll and the dough pieces. The pressure is increased to the point where the dough pieces stick to the web and are extracted from moulding roll as their paths diverge. 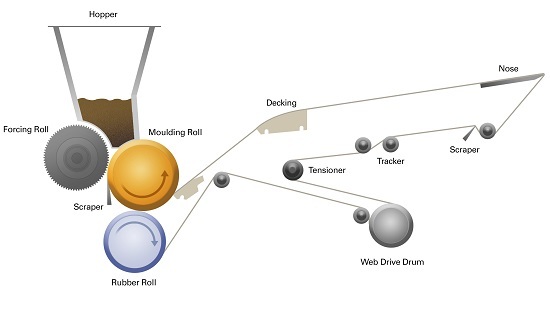 Extracting on one side of the web only is a common problem with many potential causes: typically the condition of the rubber roll and/or web, or the rolls not being parallel. 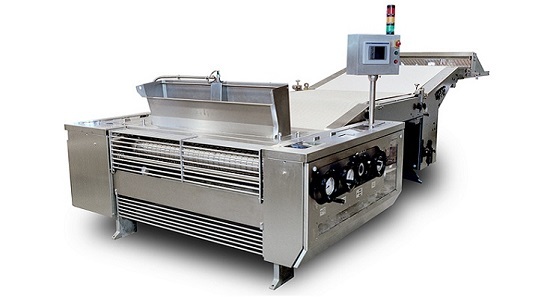 The only solution on a basic machine is to increase the pressure across the width until full extraction is achieved, but this will cause dough on the side already extracting to be squeezed out of the mould, reducing piece weight and increasing waste. A rubber roll with independent side to side adjustment allows partial extraction to be corrected without causing any new problems. The next enhancement to consider is an adjustable scraper knife. 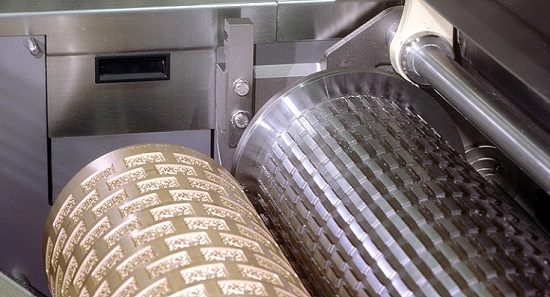 The scraper cleans the surface of the mould giving a smooth surface to the dough piece; adjusting its position enables the dough piece weight to be fine-tuned. A further refinement is to ensure that the scraper remains tangential to the moulding roll throughout its range of adjustment. For additional control over piece weight, an adjustable forcing roll gap should be considered. The smaller the gap, the higher the pressure between the moulding and forcing roll, leading to higher dough density and increased piece weight. Adding an independent drive to the forcing roll enables it to be run at a different peripheral speed to the moulding roll. Normally you would want these to be the same, but running the forcing roll faster helps where there are deep impressions to fill. The final, and perhaps least obvious, enhancement to a rotary moulder spec is an independent drive for the extraction web. Without this, the machine relies on friction with the moulding roll to drive the web, meaning that extraction takes place on the slack side of the circuit. Tension is required in the web to peel the dough piece cleanly away from the roll as it diverges from the web: extracting on the slack side of the circuit makes this much harder to achieve. In the event of poor extraction, all the operator can do is increase the tension further - which shortens the life of the web - or increase the extraction roll pressure, which causes tailings, leading to light weights and waste. The problem is solved by placing an independently-driven web drive roll after the nosepiece, maximising the tension at the point of extraction. The keyword here is flexibility. A basic or even slightly enhanced rotary moulder may appear to be good value at the outset: but if it can’t cope with recipe changes, new products or increases in output, it may prove to be a false economy. As well as the ability to cope with whatever you throw at it in the future, Baker Perkins’ Series2 rotary moulder offers fast changeovers, ease of use and simple, fast cleaning and maintenance. Enough reasons to avoid the low-cost moulder trap and invest in dependable excellence.